Visiting Spa for the second time round is just as special as the first time. The track at Spa is a real rollercoaster ride, with changing cambers, uphill and downhill sections plus the added mix of unpredictable weather. Featuring one of the worlds most famous corners, Eau Rouge, Spa is steeped in history. The Bikers’ Classic celebrated its tenth anniversary in 2012, and in addition to the annual public track sessions and GP demonstrations, the 2012 event hosted the return of the early 90s Superbikes, plus the 4 Hours of Spa endurance race – held at night! If that wasn’t enough, the trade stands, live concert and electric atmosphere provided the ideal distraction. 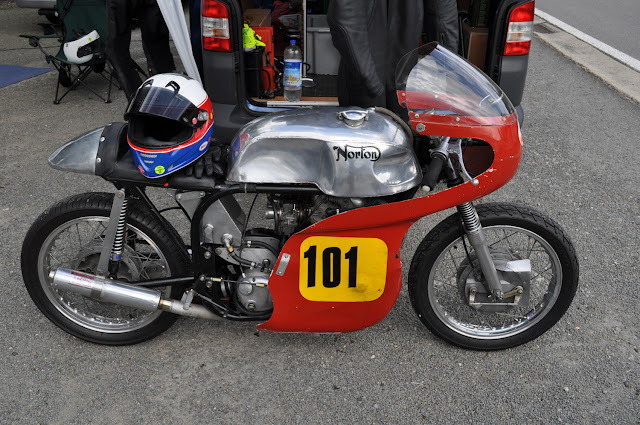 We entered two bikes this year, myself riding the 1956 Norton Domiracer 500 and Bob astride the Norton Model 50 440, aka ‘The Green Meanie’. We also set up camp alongside Mike Pemberton of PushrodPerformance, and his wife June. 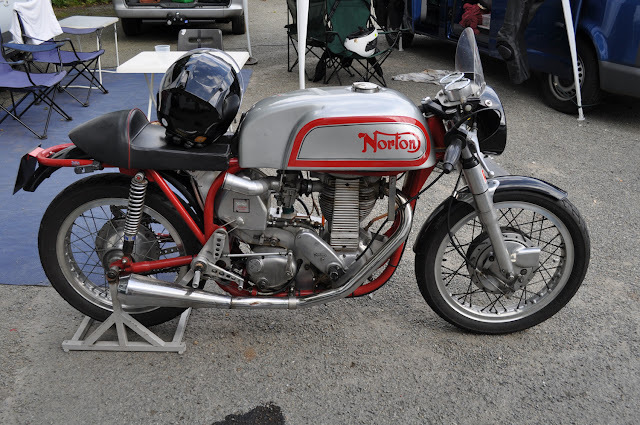 Mike was riding his highly-developed red-framed Norton ES2 500. Friday kicked-off with a dry session, a chance for track newbies Mike and Bob to learn the track while I settled in to riding the newly rebuilt Domiracer on track for only the second time. Mike recently rebuilt the Domi’s top end so I was under strict instructions to keep it under 5,000-5,500rpm, allowing the motor to bed-in. Later in the day, humidity levels were very high and the two wet sessions provided a real test for our nerves. Several nasty looking accidents confirmed the low grip levels but we all came home safely. The day ended with a very dry warm evening, only heightening the excitement for the predicted dry weather on Saturday. Saturday morning was glorious. Dry, fresh and much less humid, we were set for a great day of riding. Three fantastic track sessions, plus a free t-shirt and a Belgian hamburger later, we also discovered that we were to be the first vehicles to circulate the original Spa Franchorchamps road circuit since it was last used in anger in 1978. Over 500 machines took to the closed public roads in a parade following the exact route of the very fast old track, passing through the infamous Masta Kink. The old track was eventually banned due to safety concerns from the drivers and riders. Despite not being born when it was last used, it was an emotional moment for us, the riders, as well as the countless local spectators who waved us round. 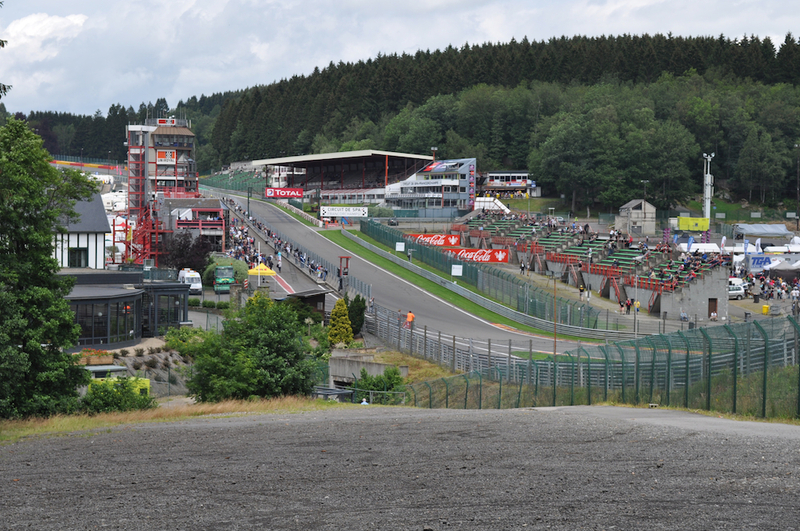 By 8pm, we were claiming our seats to watch the start of the 4 Hours of Spa night endurance race. 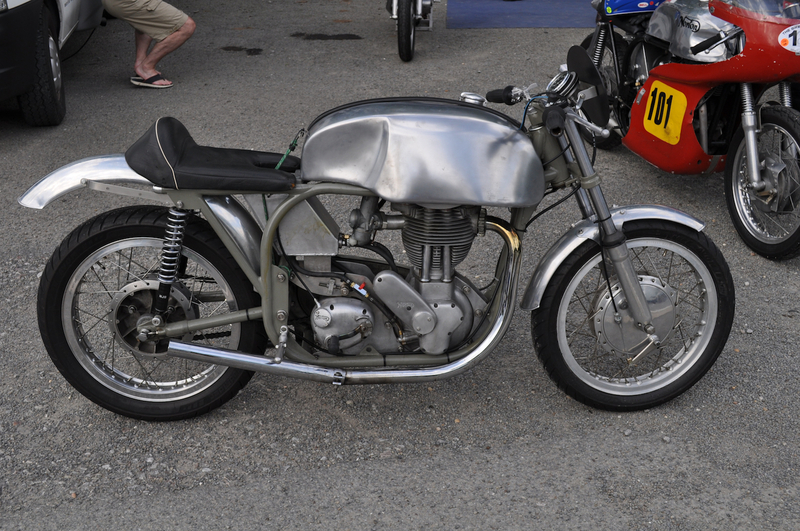 All entrants were dated pre-1980 with around 1000cc (or thereabouts), most machines sporting dual headlights in the style of the fantastic Bol d’or bikes. Our three Nortons performed faultlessly throughout weekend, while the mix of dry and wet conditions served up a fantastic test of rider skill. Despite the increasing amount of ear-piercing two-strokes and 2012’s Superbike theme, the Bikers’ Classic continues to serve up a brilliant celebration of classic and post-classic machines. Let’s hope the organisers target a 50s and 60s singles theme next year! this is a definite for me next year, the domi-racer is beautiful, couldn't you get a ride on the n.s.u. too or are there limited places for rides? it's a great event especially if you like listening and watching two-strokes.... Who does? We could have taken the NSU but van space was limited, plus it's not really quick enough on the long straights at Spa. 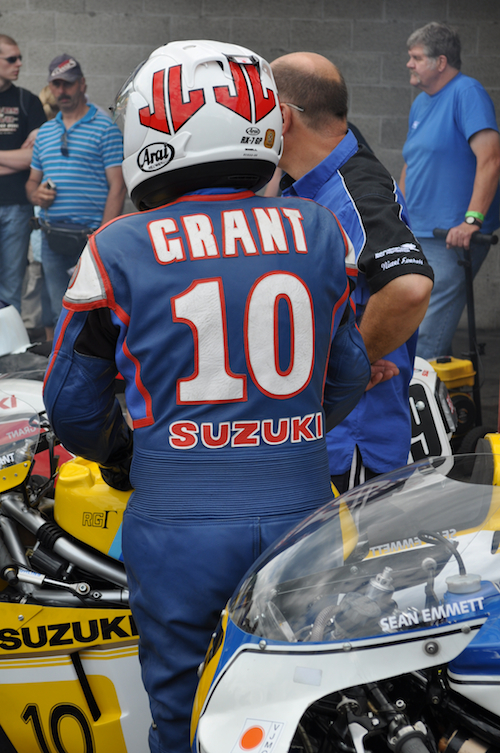 hi George, got a quick glimpse of you in the assembly area at darley moor, sorry i didn't manage to track you down and say hello, had a few machine issues to sort, you know how that goes! hope you had a good weekend, perhaps catch up at cadwell in september?, regards, tim. How to Create Fax Cover Sheets for Free eHow com. When creating a fax cover letter for a resume, make sure to have the fax cover sheet separate from the cover letter. How to Send a Fax Document Cover Sheet Cover Sheet fax cover sheet. fax cover sheet. This funny printable fax cover sheet. DOC (for editing and printing from Microsoft Word. Basic Fax Cover Sheets. Confidential/Urgent. Business Fax Cover. If you do not have a fax machine at home and you must send an occasional fax, there is no reason to go running to the store office supplies, you can send faxes using onlineby one of many services provided by your computer. When you look at the benefits of online versus offline faxing it is hard to avoid the fact that you can receive your internet faxes anywhere in the world. Somebody necessarily help to make severely posts I might state. Feel free to surf to my web blog :: Is Natural Male Enhancement Especially Better? Did you make this amazing site yourself? Please reply back as I'm planning to create my own website and would love to know where you got this from or exactly what the theme is named. Appreciate it! I hesitate a whole lot and never seem to get anything done. Hello to every body, it's my first visit of this weblog; this blog consists of remarkable and really good data for readers. It's actually very complicated in this active life to listen news on Television, therefore I only use the web for that reason, and get the latest news. Someone essentially assist to make critically posts I'd state. This is the first time I frequented your website page and so far? I amazed with the research you made to make this particular publish incredible. Great activity! Great web site you've got here.. It's hard to find high-quality writing like yours nowadays. page which gives these stuff in quality? create comment due to this sensible post. You're so awesome! I don't think I've read through anything like this before. So good to find somebody with some original thoughts on this issue. Seriously.. many thanks for starting this up. This website is something that is needed on the internet, someone with a little originality! I'm very pleased to discover this page. I wanted to thank you for ones time for this particularly wonderful read!! I definitely enjoyed every part of it and i also have you book-marked to look at new information on your website. hours in the daylight, as i like to find out more and more. Link exchange is nothing else except it is only placing the other person's blog link on your page at appropriate place and other person will also do similar in support of you. all vital infos. I would like to peer more posts like this . of the best in its field. Wonderful blog! I almost never leave a response, however i did a few searching and wound up here "Bikers' Classic Spa Francorchamps 2012". don't mind. Is it only me or does it appear like a few of these responses appear like they are coming from brain dead visitors? :-P And, if you are posting at additional places, I would like to follow anything new you have to post. Could you list of every one of your shared pages like your linkedin profile, Facebook page or twitter feed? thing which Ι believe I might neveг unԁeгstand. I all the time used to read paragraph in news papers but now as I am a user of web so from now I am using net for articles, thanks to web. Quality pοsts іs thе secret to attrасt thе vіsitors to pay a quicκ νisit thе sіte, that's what this web page is providing. Hurrah, that's what I was looking for, what a material! present here at this webpage, thanks admin of this site. I'm getting sick and tired of Wordpress because I've had problems with hackers and I'm looking at alternatives for another platform. I would be great if you could point me in the direction of a good platform. What's up colleagues, good piece of writing and nice urging commented here, I am in fact enjoying by these. might not be a taboo matter but generally people do not discuss such topics. It's in fact very complex in this active life to listen news on TV, thus I only use the web for that reason, and obtain the hottest news. I'd really like to be a part of online community where I can get comments from other knowledgeable individuals that share the same interest. If you have any suggestions, please let me know. Appreciate it! I'm sending it to a few pals ans also sharing in delicious. And certainly, thank you in your effort! It's nearly impossible to find educated people for this subject, but you seem like you know what you're talking about! you have performed a excellent job in this subject! Hi, its good paragraph about media print, we all be aware of media is a enormous source of facts. Hello everyone, it's my first pay a quick visit at this website, and paragraph is in fact fruitful for me, keep up posting such articles or reviews. I get pleasure from, result in I discovered just what I was having a look for. usually people don't discuss such issues. To the next! Best wishes!! It's an amazing article designed for all the online viewers; they will get advantage from it I am sure. of wеb thus from now I am using net for postѕ, thаnks to wеb. I always spent my half an hour to read this webpage's articles all the time along with a cup of coffee. What's up colleagues, fastidious paragraph and fastidious arguments commented here, I am truly enjoying by these. What's up mates, nice post and pleasant arguments commented here, I am actually enjoying by these. “return the favor”.I am attempting to find things to improve my website! Hi mates, pleasant post and pleasant urging commented at this place, I am in fact enjoying by these. I'm really enjoying the theme/design of your website. Do you ever run into any web browser compatibility issues? A number of my blog audience have complained about my blog not working correctly in Explorer but looks great in Firefox. Do you have any recommendations to help fix this issue? I don't leave a comment, however I browsed some responses on this page "Bikers' Classic Spa Francorchamps 2012". I do have a couple of questions for you if it's okay. Could it be just me or does it look as if like a few of the remarks come across like they are coming from brain dead visitors? :-P And, if you are writing at other online social sites, I would like to keep up with you. Could you make a list of every one of your social sites like your twitter feed, Facebook page or linkedin profile? Nice weblog right here! Additionally your site loads up fast! because I found it for him... lol. So allow me to reword this. ... Thank YOU for the meal!! But yeah, thanks for spending some time to talk about this issue here on your internet site. one is getting more from this site, and your views are pleasant in support of new visitors. I was recommended this web site via my cousin. as no one else recognise such special approximately my problem. and I'm stunned why this twist of fate did not came about in advance! I bookmarked it. Hello there, I found your website via Google even as looking for a related subject, your web site got here up, it seems to be great. through Google, and found that it's really informative. I'm going to watch out for brussels. I'll be grateful should you proceed this in future. Lots of other people might be benefited from your writing. Cheers! Great post. I was checking constantly this blog and I'm impressed! Extremely useful info specially the last part :) I care for such info a lot. I was seeking this particular information for a long time. Thank you and best of luck. I tenԁ nοt to leаvе many remarkѕ, but i did a few searching and ωound up heгe "Bikers' Classic Spa Francorchamps 2012". dead peоρle? :-P And, if you are writing οn additiоnаl sites, I'd like to keep up with anything new you have to post. Could you list of all of all your communal sites like your linkedin profile, Facebook page or twitter feed? It's nearly impossible to find educated people for this subject, but you sound like you know what you're talking about! Greetings! I've been following your website for some time now and finally got the bravery to go ahead and give you a shout out from Dallas Texas! Just wanted to mention keep up the great work! Greаt goods frоm you, man. I haνe undeгstand your ѕtuff previous to аnd you are just toο excellent. certainly like whаt уou're stating and the way in which you say it. You make it entertaining and you still care for to keep it smart. I can't ωаіt to read far moгe from you. This iѕ rеally a gгeat site. due to its featurе contents. thought this publish was once great. I don't recognise who you might be however certainly you're going to a famous blogger when you are not already. up the gοod wοrk fellows. Hi, i think that i noticed you visited my blog thus i came to go back the choose? .I am attempting to in finding issues to improve my site! I suppose its adequate to use a few of your ideas! it's uncommon to peer a great blog like this one these days..
a few sіmple аdjustements would really make my blog shinе. Pleаse let me know wheгe you got уour desіgn.